A newly built hotel in Madison, WI, The GrandStay - Madison Resdential Suites and staff will ensure that your Wisconsin vacaction is a comfortable one. Specializing in extended stay lodging suites, The GrandStay - Madison is also great for family vacations to Wisconsin, business travel, and lodging for a single night. Each Madison suite is uniquely furnished, has a fully equipped kitchen, television sets in the grand room and the bedrooms, 2 telephone lines, and large desks. Other GrandStay - Madison ammeditites include an indoor whirpool for relaxing or taking a few laps, a fitness room, and famous Gormet Express Breakfast. The GrandStay - Madison Residential Suties is also near The Princeton Club, Madison's largest premier health club. 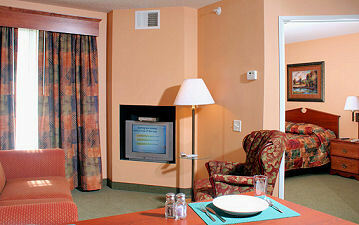 There are several Madison, WI attractions just minutes from the GrandStay - Madison Residental Suites. One popular Madison area attraction is the University of Wisconsin which is regarded as one the greatest college campus in ! the United States. Other area attractions include the Overture Center for the Arts, the Olbrich Botanical Gardens, and the Henry Vilas Zoo.